Bespoke Green Oak offers unique green and seasoned oak furniture. We also supply bespoke outdoor installations such as: pergolas, porch frames and log stores. Marrying traditional techniques with contemporary design, all of our work uses sustainably sourced English timber and is lovingly handmade to last near Romsey in Hampshire. We specialise in one off bespoke commissions and would be very happy to discuss your particular ideas and requirements. We will guide you through the design process, developing ideas, producing sketches and quotes, until we arrive at a finished solution and deliver it in person. A selection of our most popular designs are available to buy at, “off the shelf” prices. These can be seen, along with previous commissions and an expanding range of smaller gifts, on the Gallery page. 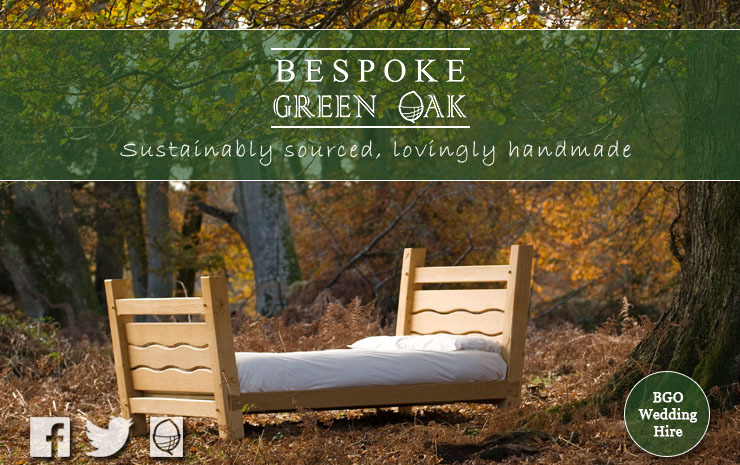 Bespoke Green Oak is committed to doing its bit for the environment. From our exclusive use of sustainably sourced English timber to our oak shavings being used by a local smokery; our commitment to the environment is not, “when possible” or, “where appropriate” but always, as a matter of course. Bespoke Green Oak is principally the creative output of Peter Guille.